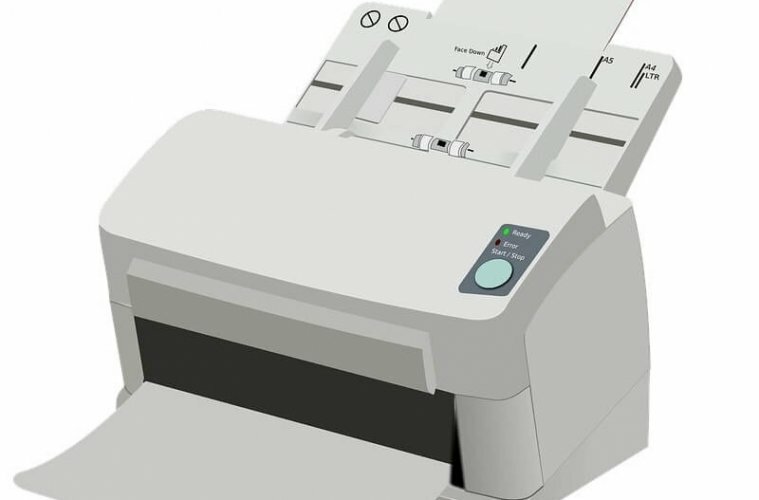 Fix Printer Offline Error in Windows – Bring Printer Online. It doesn’t matter, you’re using wired or wireless printer. Because almost 90% of Windows users are facing “Printer Offline” Error. Recently, my computer wasn’t working for some reasons. So, I decided to print a document through my Windows 10 laptop. But, even after connecting USB cable properly. I was getting “printer is offline” error. After trying tons of solution, finally, I found a working solution. But, this problem occurs due to many reasons. So, maybe, a solution that worked for me, will not work for you. So, In this article, I will try to provide a couple of working solutions. And, you need to try each solution to fix this error. Why is my Printer Offline?. As I mentioned, there could be multiple reasons. Like, Router isn’t working, that’s why the wireless printer is showing offline error. Or, maybe drivers got corrupted or not installed properly. Also, if it’s wired printer, then it could be USB or USB port issue. Whatever is the reason, let’s start trying out these solutions. NOTE: Are you in hurry, no time to find out and fix the Error. Then, you can Print from Android Phone. 1 Fix Printer Offline Error in Windows. 1.1 Solution: 1 Reboot your Printer. 1.2 Solution: 2 Clear Print Queque. 1.3 Solution: 3 Reinstall Printer Driver Software. 1.4 Solution: 4 Use built-in Troubleshooter. 1.5 Solution: 5 Unmark “Use Printer Offline”. 1.6 Solution: 6 Restart “Print Spoller” Service. 1.7 Solution: 7 Change Network Printer Properties. Fix Printer Offline Error in Windows. Solution: 1 Reboot your Printer. Almost 50% Computer problem can get solved after rebooting. The same thing applies on Printer. If the printer was working fine before with the same computer. Then, follow these instructions. 2. If it’s wired printer, then unplug the USB cable and then plug it again properly. 3. Turn on the power button of the Printer. Hopefully, the printer will back online now. I know this is the basic solution. Sometimes problems are too small, we make it big. That’s why I am starting this article with some simple solutions. Solution: 2 Clear Print Queque. When Printer unable to print a document due to some errors. Files do get stuck into the print queue. And, when dozens of files get stuck, network printer or wireless printers create issues. Though, I don’t think “clear print jobs” will solve this problem. But, still, many tech forums suggest this solution. 1. Press “Windows + I” key simultaneously to open the Settings App. 2. 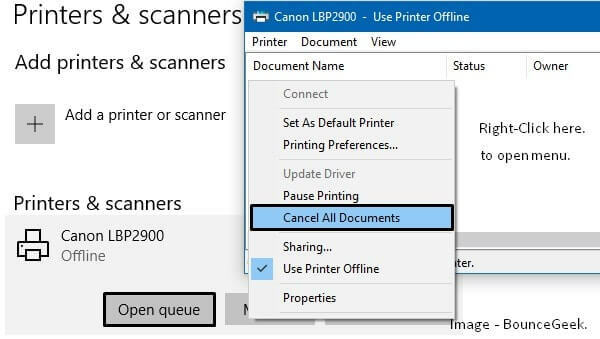 Go to devices > Printers & Scanners > Click on installed printer. You”ll now get three options, click on “Open Queue”. 3. Print queue window will open now, right click on the blank area of the Window. Then, you”ll get an option to “Cancel all documents”, click on it. That’s it, now restart your Computer. And, hopefully, the printer will get back online. Solution: 3 Reinstall Printer Driver Software. Drivers are the most important part of Computer. It helps to communicate hardware and the computer’s operating system. And, if printer’s driver files got corrupted due to some third party software. Then, problems like “HP wireless printer offline” occurs. Because, the operating system, unable to recognize the connected printer. Every printer comes with a driver software CD drive. But, nowadays, many laptops don’t come with a DVD writer. So, the only way to install driver software is, by downloading it from the manufacturer site. Before installing driver software, I suggest uninstalling old driver software. 3. Now, expand the printers section, and you”ll able to see your printer model number. 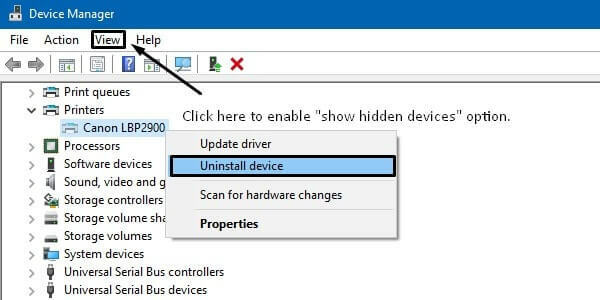 Right click on it, and then choose to uninstall device option. A warning message might appear, click on uninstall. 4. That’s it, now reboot your Computer once. Then connect the printer. If it’s wired then connect USB cable properly. Note: Please remove all other USB devices, while installing the printer. 5. 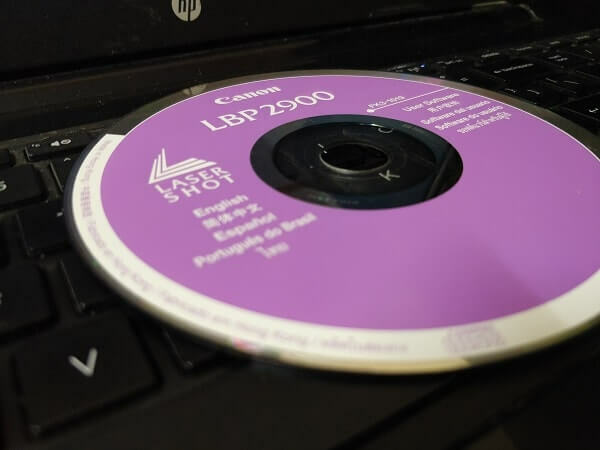 Insert Driver Software CD Drive and start the installation process. If no driver drive, then use downloaded driver file from manufacturer site. That’s it. Just follow the instructions mentioned in the setup wizard. And, hopefully, “printer offline” error will be gone. Solution: 4 Use built-in Troubleshooter. Microsoft is trying to make the Windows error-free. That’s why Microsoft provides Troubleshooter feature. And, the good news is, there is a troubleshooter for printing problems. Though, in many cases, troubleshooter unable to find out the problem. But, still, it’s worth trying. In settings App, go to update & security > Troubleshoot > Click on Printer. Now, you”ll get an option to start troubleshooter. 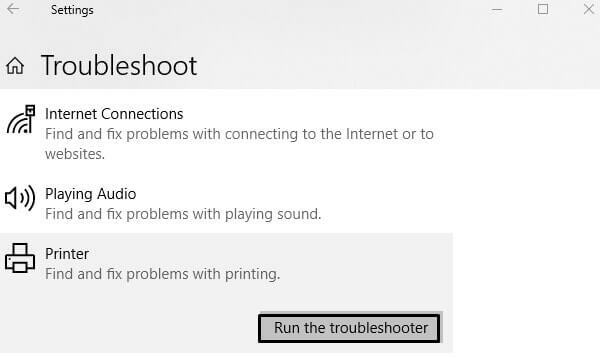 Click on “Run the troubleshooter” button. It will find out, why the printer is offline and will provide you, some solutions to fix. Solution: 5 Unmark “Use Printer Offline”. Windows comes with an option, which makes an Online printer, offline. So, the other users can’t able to print through that active printer. 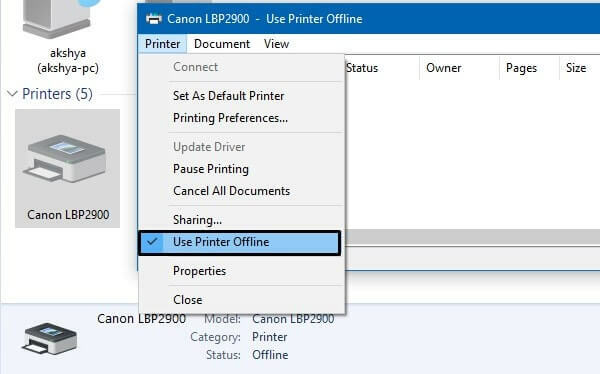 If this option is enabled in your Computer, then in status it shows “printer is offline”. You need administrator rights to disable this option. So make sure you’re logged in the computer through Microsoft Admin Account. 2. Right click on your printer model number. After that click on “See what’s printing”. 3. From the menu, Click on Printer and then unmark “Use Printer Offline” option. If, it’s enabled or marked. That’s it, now you can check the printer status, it will show online. 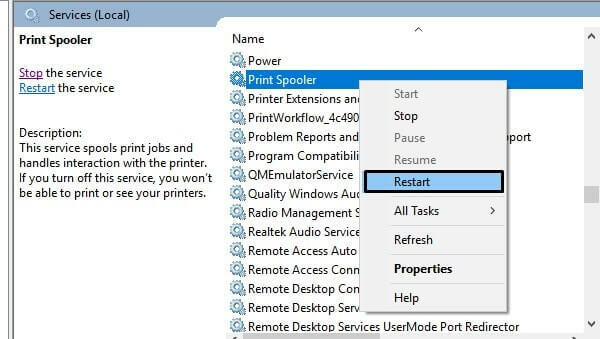 Solution: 6 Restart “Print Spoller” Service. Printer spooler service handles print jobs and also printer interaction with Computer. If something is wrong with this service, then also Computer shows “network printer offline” message. We can fix this problem by simply restarting this service. Press Windows + R simultaneously, type services.msc and press enter. In services Window, look for “Print Spooler” Service. Right Click on it, and then click on restart button. That’s it. now hopefully, printing service will back online. Solution: 7 Change Network Printer Properties. 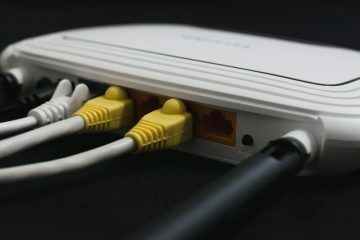 This solution is for network printers. Although, I don’t own a network printer. But, still, this solution is helpful for many users. That’s why I suggest trying this solution once. Go to the same “Device and Printers” section in Control Panel. Right Click on your printer, then click on properties. In Properties Window, click on the ports tab. Uncheck SNMP status enabled option. And, click on OK to save changes. After making changes, restart your computer once. And, hopefully, you”ll not face “Printer offline” error in wireless printers. 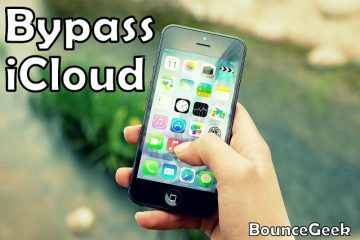 Previous ArticleTop 5 Android Apps for Mobile and Desktop Use. Next ArticleSolutions to fix Discord mic not working, not detecting mic. Fix: Audio Services Not Responding in Windows 10. 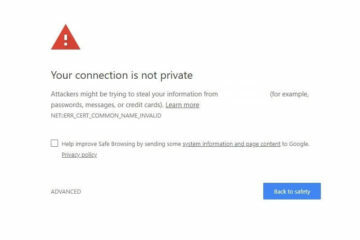 Fix Your Connection is Not Private Chrome – Privacy Error. 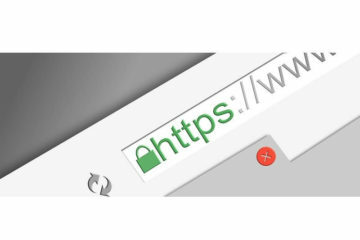 Solutions to fix ERR_SSL_PROTOCOL_ERROR in Chrome Browser. Fix – discord won’t open and stuck on the main connecting screen.